Earlier today, the North Carolina Senate gave final approval to the 2013-15 fiscal year budget. The House chamber is poised to follow suit later this afternoon. 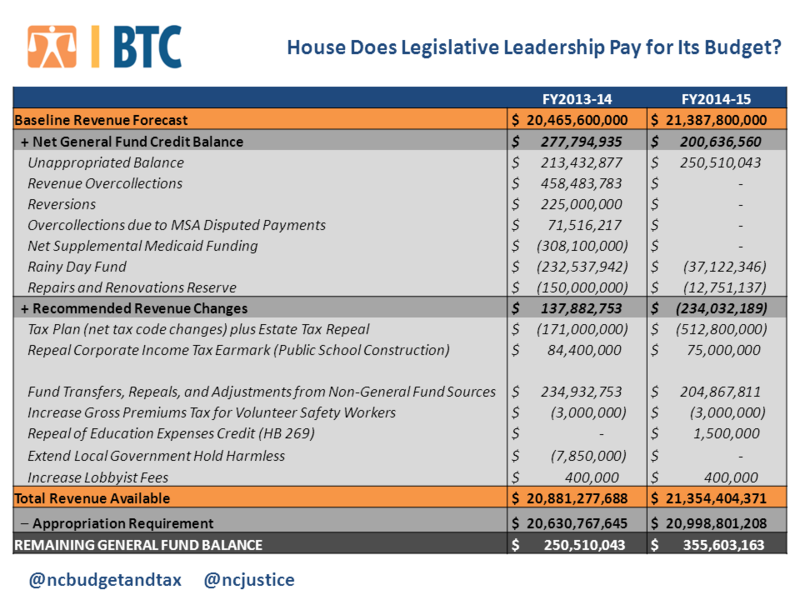 Throughout the budget debate, legislators have spent a considerable amount of time providing an overview of the final budget but continue to skip over how they pay for the proposal. This practice is not uncommon. How the state raises the billions of dollars that fuel the state budget gets relatively little scrutiny compared to the rest of the budget during the budget process. The state expects to receive nearly $20.5 billion in base revenues. $19.6 billion will come from taxes, primarily from the state income tax, sales tax, and corporate income tax, and $837.5 million will come from other non-tax sources. But, the final budget spends $20.6 billion, leaving the state approximately $106.9 million short. The state loses hundreds of millions due to tax cuts. By repealing the estate tax and linking tax cuts for the wealthy to their budget proposal, the legislature would reduce resources by $171.0 million in FY2014, and $512.8 million in FY2015. When combined with the loss of the state Earned Income Tax Credit, this tax-cut plan is far from true reform and will result in a tax shift, requiring low-and middle-income families to pay, on average, more while the highest income taxpayers pay less. Budget writers use funds left over from this year. The final budget includes $277.8 million in unspent funds from this fiscal year, money they anticipate being returned by state agencies, a revenue surplus from this year, and various other sources (see the chart below). Budget writers borrow from the Highway Fund. The final budget transfers $218.1 million from the Highway Fund, which is one of the state’s two major sources of transportation funding. Most of this money will support the State Highway Patrol, which was shifted to the Justice and Public Safety section of the budget in 2011. This transfer is reflected in the non-tax revenues section of the availability statement. Budget writers use budget gimmicks and increases fees. They raise $308.8 million by scrounging up revenue from a wide variety of sources—including fee increases. They also repeal and transfer special fund set-asides for public school buildings, clean elections, economic development and others. Budget writers leave money unspent. There is an unspent General Fund balance of $250.5 million. The General Fund availability statement is summarized in the chart below. *These figures reflect the combined impact of the joint tax plan and repeal of the estate tax. However, the bill that included the tax plan also repealed the School Capital Building Fund, bringing the net impact to $524.4 million over the biennium. Using funds left over from this year…..well luckily the Medicaid debacle actually left some money on the table. The over runs on that program alone are astronomical. I guess it is a win that the NCGA ran the previous budget process well enough to have some left over, the fiscal sanity is reaping dividends. The last point, leaving money unspent, that is a good thing you know. Having something left to say have a cushion when this government borrowing bubble explodes is another case of sound fiscal policy. I know you guys will find somethign to cry about, but this actually leaves dollars for if we need to fund a quick increase in unemployment payments or a quick decrease in tax receipts due to another Obama recession. This is definitely a good long term plan.